If you are running a modern, cool restaurant and want to attract many new visitors, you need to check out the Modern Theme. It is one of the great MyRestaurantTheme designs, specially created for modern restaurants. If you want to promote your place in a nice, functional way with a great new age style, this is the right theme for you. 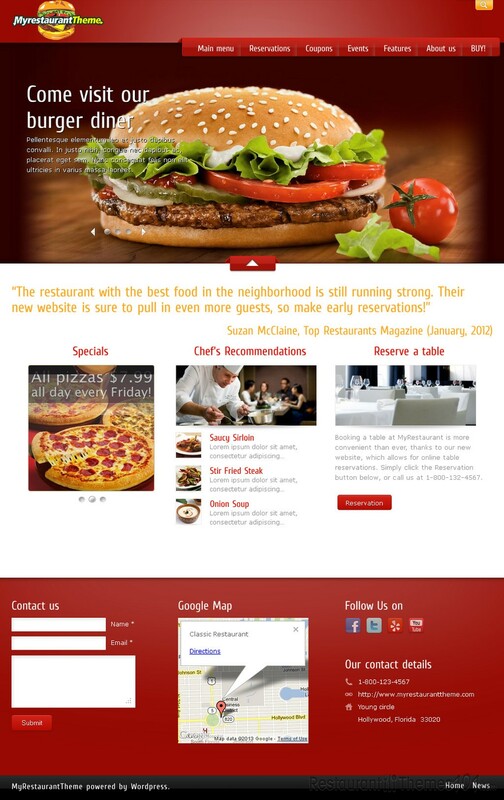 Modern Theme is a responsive restaurant WordPress theme. It features a catchy, simple layout with nice, lively colors selected and many useful options. The main colors are red and white, making this layout very noticeable and eye catching. The homepage is enhanced by an attractive wide slider where you can add photos of your delicacies and get your visitor’s eyes and stomachs hungry for your food. A great categorized menu can be found on the homepage right under the slider, and it also comes in a sliding form. It is very easy to create it and it looks super cool and modern. You can feature your favorite dishes on the homepage in form of daily specials of your chef’s recommendations. Tease your visitors with thumbnail photos of your delicacies posted on your homepage, and after clicking them, they will be taken to a page where they can read everything about the meal. This theme doesn’t only look great, it is very functional too. 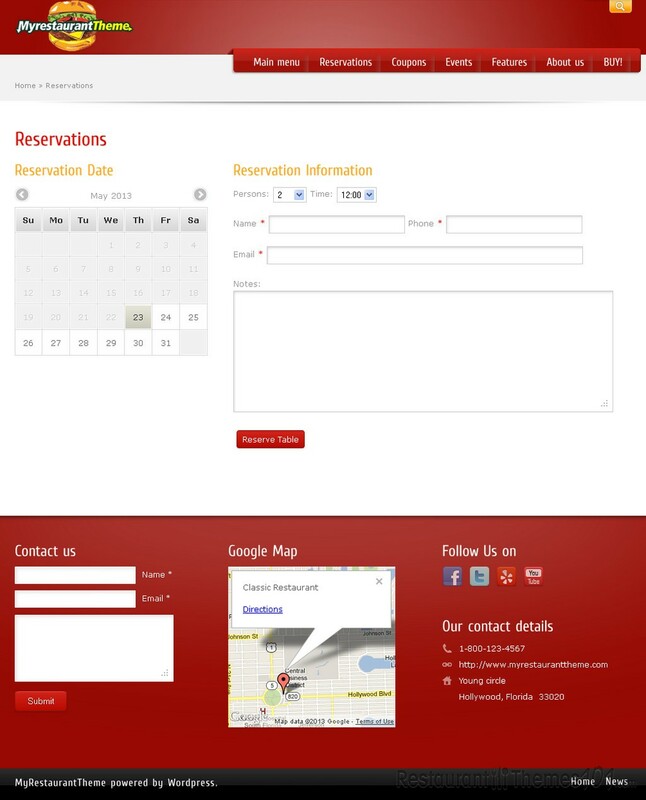 Among many other great features, a great reservation form stands out, making it possible and very easy for your guests to book a table right there on your website. Modern Theme is OpenTable compatible. The Google Maps integration is also there to make things simple for you and your visitors, giving them exact directions to your restaurant. The theme has a coupon system integrated, and a great social integration making it easy for you to connect with Facebook, Twitter, YouTube and Yelp. The Modern theme is highly customizable. It comes with great shortcodes and customization is very easy, even if you have little or no coding knowledge. The theme is fully responsive and you can be sure your website will look terrific no matter what device it’s seen from.